Are you looking for a way to help your website visitors easily find relevant related information online? 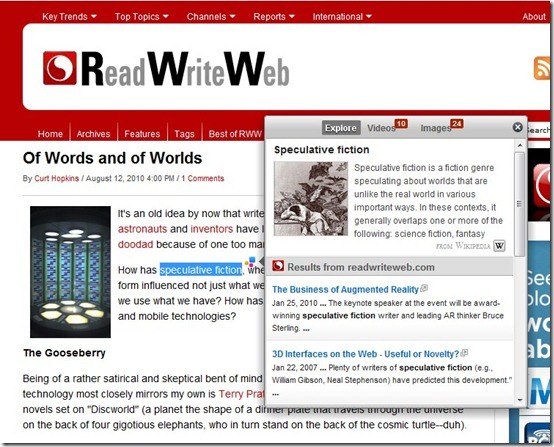 The folks over at ReadWriteWeb have just added a great new search feature to their site, courtesy of Apture.com. When you highlight any word, phrase, or even a part of a word on any page on the website, a small “speech bubble” appears with the word “search”; click on that, and you’re given a small window with articles, videos, and images that are directly related to the highlighted term. Web users today demand more than today’s “flat” pages. Users’ attention are shifting to sites that fulfill their curiosities with engaging, media-rich experiences. Apture makes it easy to bring your website to life by quickly integrating rich media from all around the web, so your readers can see, hear, feel and understand the topics you write about. Finally, Apture keeps visitors on your site and increases the amount of time people spend there, by allowing users to browse content without leaving the page. And if your nonprofit’s primary goal is to raise awareness of your issue or cause, this could be an extremely useful tool from that perspective, too. Apture is free for websites with fewer than five million page views per month. For more information, see the FAQ at Apture.com. Great follow up to Marshal Kirkpatrick's tweet yesterday Rebecca! I think it's pretty impressive. What's also nice is that it's much less initially intrusive to the user than the type of annoying link bubbles that automatically invade the space when you mouse over like snapshots on a wordpress.com site (please everyone, disable! :-) ), or VibrantMedia bubbles on sites like the Globe and Mail. Also, the search bubble doesn't seem to intrusively pop up when you select large blocks of text (like a paragraph), which is kind of nice if you're looking just to copy to quote, etc. Really great to see that the search bubble includes search results from the host site itself (that's a killer app for me). I'll explore, but it would be neat if you could define some of what else appears in the search bubble, to ensure that it's relevant to the context, purpose and voice of your site, which would be especially important for charities and non-profits (Wikipedia and Google (including YouTube and Google Image search) seem to be the defaults, which would generally seem OK - tried "child exploitation" in a RRW article and the results were acceptable). Great new resource to highlight! You might be interested to know, I installed Apture on a couple of sites last night and the search bubbles did, in fact, show results from within the sites as well as from out on the wide Web... I'll be keeping an eye on this and delving deepers to see how it performs in the long term - appropriate content is absolutely key! - and also how retention rates are affected. So far, it's a pretty impressive little tool. I'm new to your blog and really appreciate this kind of helpful information and review. I'll definitely check this out. Sounds like it could be a valuable addition to my personal blog too, as well as the nonprofit on whose board I serve.